Later, after all the kids were at school and Dietrich played happily upstairs, I turned up the music and started to wash dishes. And I reflected on my bad mood and wondered where it had come from. Sure, the boys were extra hard to deal with this morning since Will came downstairs in a bad mood and neither of them could seem to get along. But, as Becky Bailey says in her book Easy to Love, Difficult to Discipline, “you are never upset for the reason you think you are.” When I started really taking the time to notice how I was feeling and to allow myself to feel it, I realized that I was feeling a sense of melancholy deep inside. I had noticed it yesterday as well. Perhaps my emotional reactions were just this melancholy trying to break out and be felt. It’s hard to allow yourself to truly feel sad when surrounded by 4 rambunctious children. But that is what I apparently needed to do. So, today I’m creating some space to feel sad. I’ve reread that painful blog post from Feb 22, 2006. I might pull out Emma’s album and look at her pictures. I’ve shed a few tears. And I’m writing, which is therapeutic for me and allows me to just feel what I need to feel. I want to encourage each of you as well, to take the time to feel. No matter what emotion you are currently experiencing, give yourself permission to actually feel it. In my parenting, one of my goals is to help my kids also learn how to recognize what they are feeling and to give them permission to feel it. This is hardest when it comes to anger. It is easier to say, “stop being angry!” But I know that isn’t realistic or healthy. We can’t stop ourselves from getting angry. We will do better if we take the time to recognize that anger and then make healthy choices instead of allowing our anger to control us. The same is true for sadness. Although in the case of sadness, I think we sometimes do need to allow sadness to dictate our actions, as long as those actions are healthy for us and others. We need to grieve. We must. This is true for both men and women. In this 10th year since Emma’s death, John and I have had some conversations about the grieving process for both of us. I had both practical and emotional support from many women, especially those who had also walked through the pain of losing a child. But there were no men who came alongside John in the same way, offering him a chance to process, a safe place to cry, encouragement to go to support group or counseling. My support group was open to men, but there were hardly ever men there and John would not have felt comfortable going. Why is that? I don’t think it is any one person’s fault. I don’t think John thought much of it at the time, it is now as he looks back that he recognizes the difference in expectations. And he thinks it should be different. We both agree that our culture is failing men in this regard. So, no matter your gender, please give yourself permission to cry. Give yourself permission to really feel the emotions that are difficult. And then come alongside those who grieve and give them permission also. At the beginning of this month, I was not sure how smoothly the month would end. I was feeling homesick, wishing for Emma’s photo album which got left in the States, and wishing I could visit her gravesite. Last week I had the opportunity to share a testimony at the German/English bilingual Bible Study I attend, and this gave me a chance to process some of these emotions. Even though my testimony ended up being less about Emma, and more about depression and anxiety, I found that working on it was very therapeutic. And this month was full of other blessings which showed me how much God loves me and is so willing to provide for each of my needs, even emotional ones. There are always those who remember Emma’s birthdays and that means a lot to me. What surprised me about this month were how many people here are already willing to connect with me over those memories. I received notes, flowers, and visits from these ladies, and am filled to overflowing with gratefulness. I even have a kindred spirit here, someone whose daughter, also born in 2005, awaits them in heaven just like Emma. What a blessing that God put us together to hold each other up and support each other through our memories. My husband and I attended a parenting seminar recently. One topic covered the importance of teaching our children a theology of suffering. As we have seen in our study of Acts, suffering is a normal part of the true Christian life. But we have a promise of comfort and of joy in the midst of our trials. Paul understood this well. In 2 Corinthians he wrote: “Praise be to the God…who comforts us in all our troubles” He continues to share why we are not overwhelmed by trials: “do not lose heart…For our light and momentary troubles are achieving for us an eternal glory that far outweighs them all.” Our troubles are small when compared with the eternal life that God has given us. Even physical death can be seen as something small to the Christian, because it is just like changing our clothes. We leave behind our earthly body and are clothed in our heavenly one. I am thankful that my parents taught this theology of suffering to me. There are several things that happened in the lives of my grandparents and parents that could be considered tragic. I grew up hearing all these stories, but they were never told to me as sad stories, but rather as stories of victory. Suffering is a part of life, but because of God, we have victory over it. He protected and provided through all these things, and on top of that he gave us joy. When I was a little girl the two things I wanted to be were a wife and mother. I got married at age 20 and had my first daughter 3 years later. John used to tease me that at the age of 23 I had achieved my life goals. My life was just how I wanted it to be, and things should have been perfect. But they weren’t. I cried all the time. I was filled with worry. I had a hard time motivating myself to get off the couch. I was dealing with postpartum depression. I ended up on anti-depressants for a couple months. Depression and anxiety plagued me with the following 3 deliveries and off an on between babies as well. Even though I pled with God not to take me through those dark days, he still did. But each time I found him there in the darkness. When I felt like I was spinning out of control, like I couldn’t hold on any longer, it was as if he said to me: “Go ahead and let go. I’ve got you.” I always started anti-depressants fairly quickly after delivery, so things were not bad for long, but the days I spent directly after birth were the hardest thing I ever have had to deal with. And yet, I am still thankful for them, because of what I have learned about God, about myself, and about others. When Elise was 2 1/2 years old, her sister was born. Whereas Elise had been large and healthy and had developed at an exceptional rate, Emma Anne was small and weak and delayed in her development. She was born on July 14, 2005 and 7 months later on Feb 22, 2006 she was born into heaven. 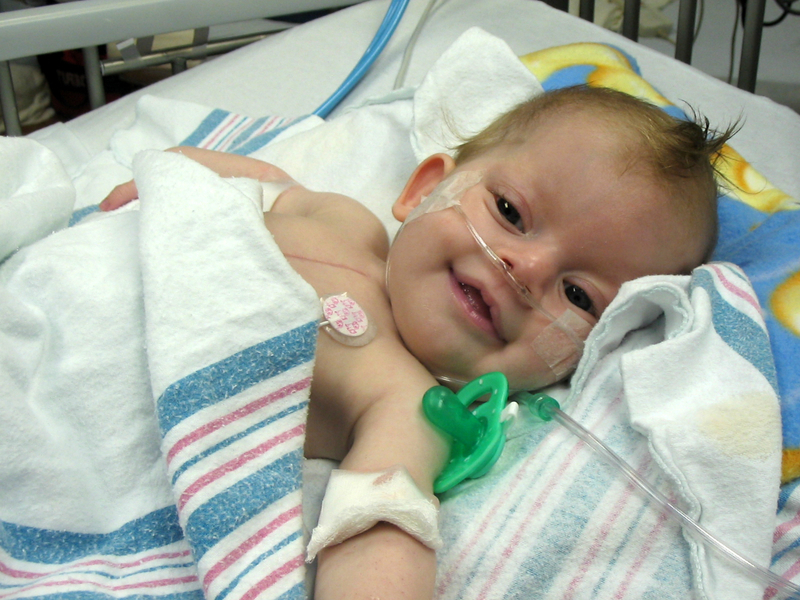 Emma had several heart abnormalities, some brain damage, unique physical issues, and breathing and eating difficulty. Her life was spent in and out of the hospital as the doctors tried to determine the underlying factors and how to treat her. I remember clearly the day I realized that I was the mother to a handicapped child. I fled the hospital room that Emma and I were staying in and found a bench in the hospital garden and sat and cried. I was sorry for Emma and I was sorry for myself. I realized this meant I was committed to caring for her needs through all her childhood and most likely into her adulthood as well. I cried for Emma, what she might not get to experience, and I cried for me, for what I might have to sacrifice in order to care for her. And then I dried my tears. I returned to our little hospital room and I never again spent time feeling sorry for myself or Emma. I found real joy in caring for Emma, and God protected my relationships with John and Elise even though I didn’t get to see them that often. 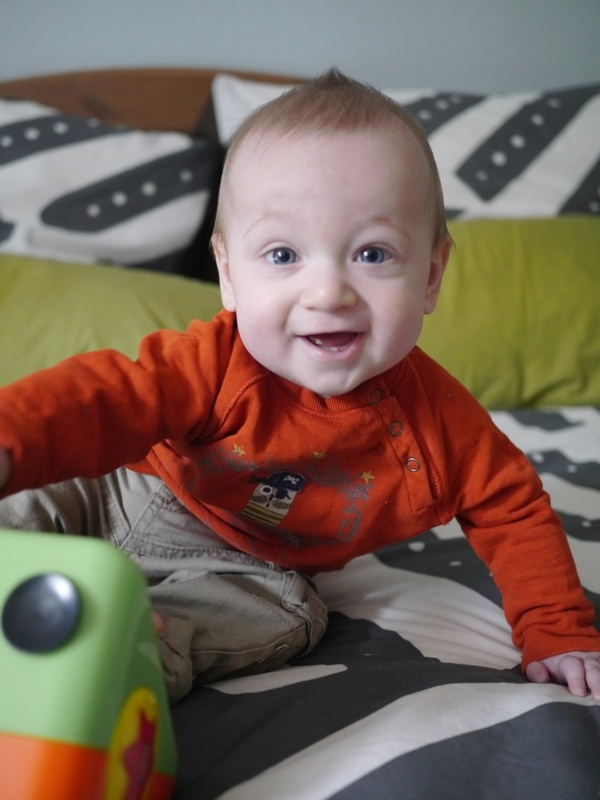 Having a child with extreme physical difficulties can destroy a marriage, but I think it strengthened ours. And of course losing a child is something that many marriages do not survive, but when Emma died we experienced firsthand the amazing protection of God. Not only did he provide for our financial needs during that time, which were great because of the hospital bills, but he also cared for us emotionally. Instead of falling into a dark depression, which I felt was a real possibility, I felt held up and supported by God, by family and by the church. I grieved, but I was able to grieve openly, to share with others the joy and comfort that God gave me during Emma’s life, after her death, and still does in my memories of her today. 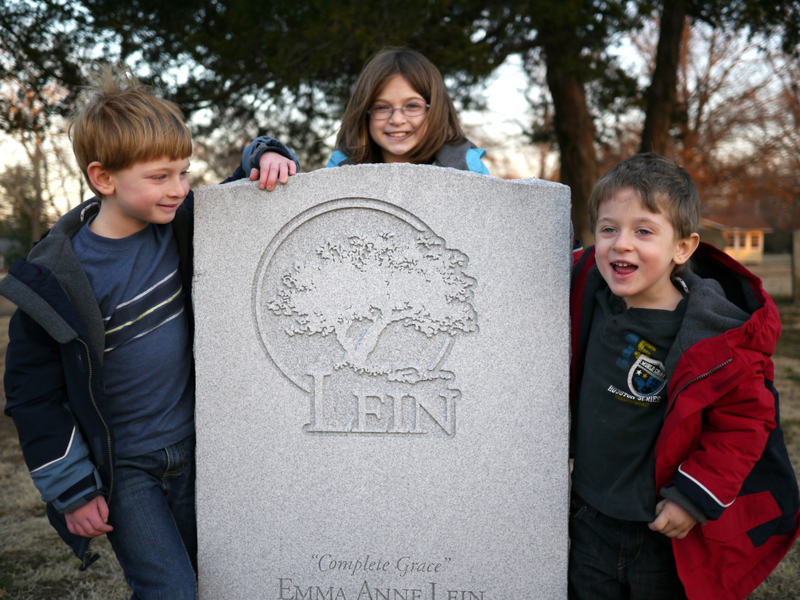 Several years after Emma’s death John and I thought our family was complete. God had blessed us with two little boys, Will and Seth, and we were beginning to explore opportunities in missions. We officially joined TeachBeyond in December of 2011, and in January of 2012 we started support raising. By the fall of that year we felt very stressed with continued support raising and no real idea of when we’d be able to leave for Germany. And then we found out that I was pregnant again. During the first few weeks of that pregnancy I began struggling with fairly extreme anxiety. After a very serious panic attack, with side effects that lasted for almost a day afterwards, John and I realized I needed to get help. I was dealing with what is termed antepartum depression and anxiety. It is just like postpartum, it just happens before the baby is born. Anti-depressants were not a good option for me at that point because of the risks for the baby, so I started once a week counseling and taking natural supplements. Thankfully things improved, especially once I got past the first trimester. But I was worried about how hard it would be to transition to a new culture and country with my emotional instability, and I was worried about dealing with postpartum depression away from my friends and family. God’s gift to me this year has been to provide a new support system, and to grant me an incredibly smooth transition to life in Germany and an almost entirely anxiety-free postpartum period. It means a lot to me that not only did God prove that he had the power to overcome, just as I always believed he had, but that he loves me so much that he chose to overcome. And of course, there’s Dietrich, my special German blessing. 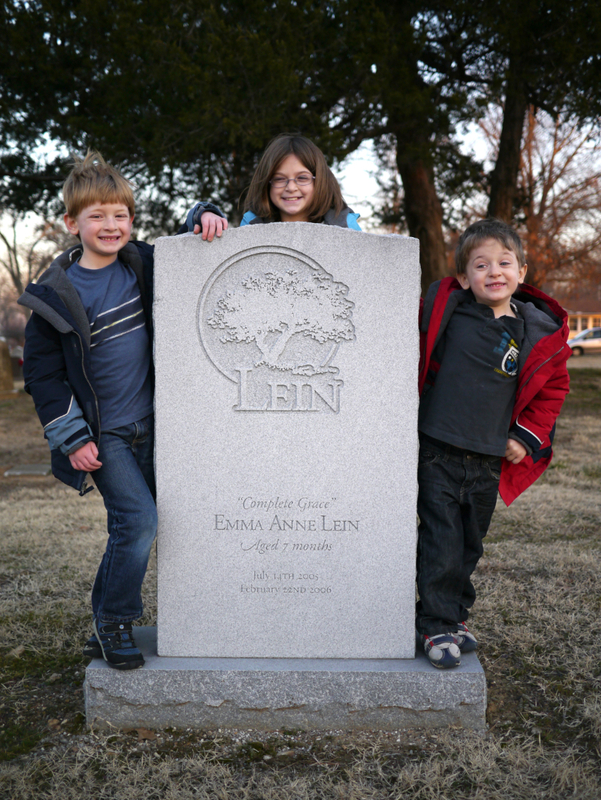 It’s hard to believe that it has been 7 years since we said good-bye to our precious Emma Anne. Her birthdays still have the power to bring up emotions in me, but I’m not afraid to live through them. This year I actually had the wrong date in my head, so we celebrated a day later, but it was still a good day. As usual, I took a day off from the computer to mark this special anniversary. I wish I could say I spent a lot of time in prayer and reflection, but as often happens we ended up having several interruptions to the day. But they were all good interruptions, things that showed me God’s care and love. I’ve been feeling quite isolated the last two weeks as we’ve fought the flu. I’m limited to what I can get out and do even though I am better, because the boys are still sick. But on Friday I was able to get out to see my counselor for the first time here in Germany and to visit with another new friend as well. It was helpful to me to be able to share a few details of Emma’s life and her place in our family. We obviously weren’t able to go to the cemetery as usual. But we went the day before we left the states and were able to get our usual pictures. On Saturday, Elise and I walked down to a cafe in town and bought some slices of fancy cheesecake and other cakes to celebrate Emma’s heaven birthday. We had a nice relaxing family day. What would it be like to have you here with us? To hear your laughing voice as you egg Will and Elise on in their races. To see your wavy brown hair dance in the wind. To hear you read to Seth and do a puzzle with Will. To see you snuggle up with Elise as she shared her favorite story with you. To feel you close as you kissed my cheek. To hear you hurry to greet your Daddy as he walked in the door. I can only imagine what it would be like to add you to our crazy life. What your place would be. What you would look like, what you would say. I don’t think about it often, and when I do, it hurts. Because the reality is that you never even got to see a Spring. Although, how can I compare Spring on earth with the perfect season of heaven. I know, that no matter what you missed here on earth, you have more than I can ever imagine in heaven. I know that no matter how many days we live without you here, there will be more than I can number with you later. July 14. This date usually looms in my head for at least a week if not more before it hits. But not this year. For some reason, perhaps the hectic activity surrounding our move and the arrival of our goats, the date snuck up on us. My good friend Laura wrote on my facebook wall that she was thinking of me today as I remembered Emma’s birthday and I suddenly realized what day it was. Funny that someone else thought of it before me this year. Is that good or bad? I’m not sure, but regardless I was glad someone brought it to mind, because if for some odd reason I had gone through the whole day without realizing that it was Emma’s birthday I would have been terribly disappointed once I realized it on the next day. Laura wasn’t the only one who remembered, another good friend Melinda texted me her encouragement and many others commented on my facebook post in remembrance of Emma. With remembrance of course came emotions. Not bad ones, just strong ones. Longing, I guess it could be called. With the kids gathered around me, I shared with them the reminder that today was Emma’s birthday. Will piped up immediately. “Are we going to the grave?” Hmm, yes, I guess we could do that I thought. Funny that without trying too hard we have developed a tradition, one that even Will knows. I’m so happy that they want to go to commemorate Emma’s special days, and that they believe we should all be there. And I’m thankful that John agrees as well. So I sorted out the logistics and we had a plan. During Elise’s gymnastics class, I took the boys with me grocery shopping. We picked out some bright purple and green flowers that seemed to fit the emotions I was feeling. We took them home and put them in water waiting for the evening when Daddy could go with us to the cemetery. Our visit was quick as we were running a bit later than I had anticipated. And we were on our way to a swim party, so the kids were all dressed in swim suits for our usual picture, but it doesn’t matter. Because now I can remember what we did that day every time I look at the picture, and it seems fitting that in some small way Emma was included in a family celebration. Being a mother through life and loss. I’ve been thinking a lot about what it means to be a mother lately. This year in my Mothering Matters group I’ve been convicted many times of my shortcomings, and encouraged to try some new things in my parenting. This month in particular has been a time of reflection for me on my relationships with my children. Elise turned 8 this month. That means I’ve been a mom now for 8 years, or slightly longer if you count my pregnancy with her. A lot has happened in those 8 years. Elise is the only one of my children who lived through the short life and loss of our daughter Emma with John and I. Sometimes I think that should be a special sort of bond I have with her, but more often than not, I feel that instead, that time in some way damaged our relationship because of how often I was gone from her. 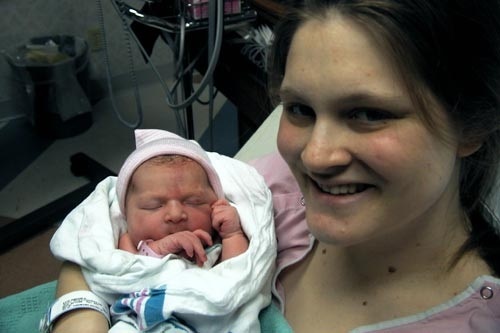 Elise was only 2 1/2 years old when Emma was born. She had turned 3 just weeks before Emma passed away. She was around the age of my boys now, and I can’t imagine being away from them for long periods of time, yet that is what we did. I had to make a choice, even though it wasn’t conscious at the time, to parent Emma instead of Elise. When Emma was at the hospital, so was I. And because John was working, that meant Elise was usually with either his family or mine. Now, not all of that was bad. I love the fact that Elise built such wonderfully strong relationships with her grandparents and aunts and uncles while I was gone. I love that she is fairly independent and strong because she didn’t have to rely on having me with her at all times. But I can’t help but wonder if by missing that key bonding time I somehow missed something important in her life. Sometimes I think it is all in my head, but there are times that I see that she too feels something is missing in her relationship with me. I don’t think she traces it back to those early years, and perhaps I shouldn’t either. I don’t know. But I have recently come to the realization that instead of focusing on what I cannot change, I need to work now at discovering exactly who this child is and how best to parent her now. I want to do that with all my kids. Mothering is hard work. I am finding it takes a lot of mental planning, emotional strength, and physical choices to do it in the best way. And even then, there will always be pieces missing, but I think God did that on purpose so we would learn to rely on him, who is the true parent of our children. Yesterday, I did what I have now done every year since Emma passed away. I fasted my computer time on February 21st. It was a restful relaxing day. I didn’t do as much reflection time as I have in the past, I just merely tried to relax and enjoy my kids. It was a wonderful day and I wish every one of my days could be as relaxed and restful as that one was. Today is Emma’s Heaven Birthday. She has now lived in heaven 5 years (well, I don’t think they keep track of years in heaven, but for us here on earth, we have missed her now for 5 years). It isn’t a sad day, not entirely. It is a joyful day, a day to remember God’s provision, his grace, his love, and his care. God walked alongside us closely as we cared for Emma and also as we mourned her loss. I cannot regret what we went through, because I would not give up the benefits we claim because of it. 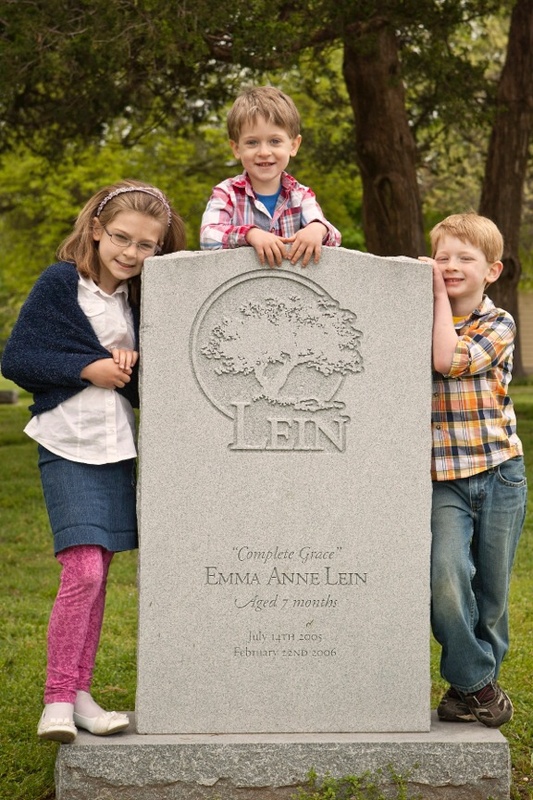 As I got the kids ready to leave to go pick out flowers for Emma’s grave today, Will wanted to know more about our plans and the reasons behind them. “Today is Emma’s heaven birthday,” I told him. “It’s the day we celebrate her going to heaven.” “Celebrate?” asked Elise. “How can you celebrate when you are sad?” I tried to explain that we celebrate because Emma is happy in heaven, even though we miss her here. But I know it isn’t always that easy. Even though we knew that we were happy for Emma from the very day we lost her, we also were very very sad. But that overwhelming sadness doesn’t fill me anymore. No, today I can truly celebrate. I’ve thought a lot about a family I know that recently lost their baby and though I don’t wish I could take away their sadness, because I know it is a path they must walk, I do wish I could show them a glimpse of the future. A glimpse of their family and the joy that will fill their hearts if they let it. But it is a long way down the road. We added our blooms to some beautiful flowers someone had already left at the cemetery (Thank You!) and took our annual picture of all our kids. Thank you all for praying and asking me how I am the last few days. We truly are very happy.